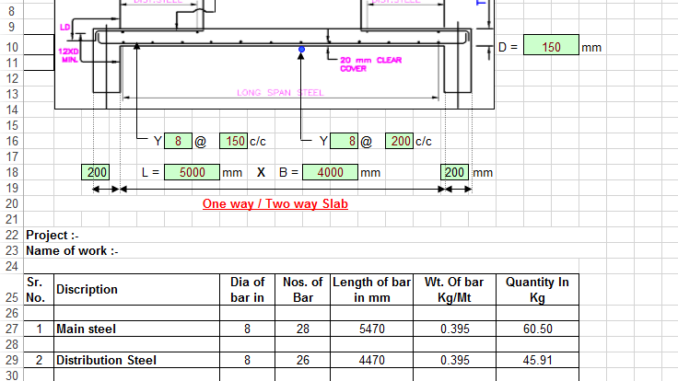 One way slab is supported by beams in only 2 sides. 2) The ratio of longer span panel (L) to shorter span panel (B) is equal. or greater than 2. Thus, L/B >= 2. 3) Main reinforcement is provided in only one direction for one way slabs. Two way slabs are the slabs that are supported on four sides and the ratio of longer span (l) to shorter span (b) is less than 2. In two way slabs, load will be carried in both the directions. So, main reinforcement is provided in both direction for two way slabs.